Wes Ellis: Did Dispensationalism Start With Darby? Did Dispensationalism Start With Darby? That would be the common answer. But Danny over at Community of the Risen seems to be convinced otherwise. He writes a review of a book called Dominion of God: Christendom and Apocalypse in the Middle Ages by Brett Edward Whalen (PhD Stanford University). Danny writes that "the book combats the false notion that the theology of dispensationalism is a modern invention by Darby." Now, I don't yet agree with Danny. 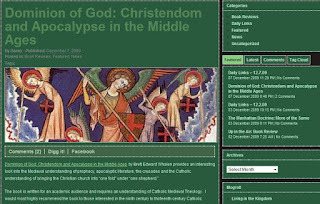 Many authors, including Paul Boyer, are quite familiar with Medieval theology and it's conceptions which seem to coincide with dispensationalism and they still attribute what we know as dispensationalsim; with it's unfolding seven dispensations, its' rapture doctrine, and most importantly its' understanding of Israel's role in the "end-times" to John Nelson Darby. Were the medieval theologians dispensationalists? Or did they just provide convenient avenues through which Darby could construct his new theology? Check out the dialogue at Danny's blog. The answer to your question can be found in "Pretrib Rapture Dishonesty" which is found on Google.